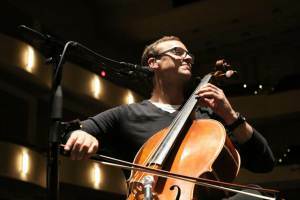 PENSACOLA, Fla. – Innovative cellist and singer-songwriter Ben Sollee kicks off the 59th annual Lyceum Series at Pensacola State College with an unconventional twist at 7:30 p.m. Saturday, Aug. 26, at the Ashmore Auditorium, Building 8, on the Pensacola campus, 1000 College Blvd. A classically trained musician with a deep technical command, Sollee has earned accolades for incorporating elements of folk, bluegrass and R&B into his singular musical style. The Kentucky native has been described as a relentlessly curious musical soul for whom change constantly comes. His genre-bending talent ranges from composing and performing music for ballets, films and stage to concerts at Carnegie Hall and tours throughout the United States and Europe. He even cycled 5,000 miles by bike, towing his cello “Kay” behind him as part of the “Ditch the Van” tours.